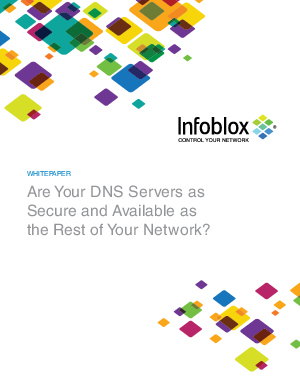 > Infoblox > Are Your DNS Servers as Secure and Available as the Rest of Your Network? In 2012, 7.8 million new malware threats emerged. Mobile threats grew by 1,000%. 865 successful breaches compromised 174 million records. According to a 2012 study by Ponemon Institute, the annual cost of malware breaches across 13 industries averaged $8.4 million. This rapidly growing threat landscape directly targets any organization’s Domain Name System (DNS) servers. DNS can be a hole into an organization’s security infrastructure creating channels for successful attacks. These servers are an often-overlooked weak point that traditional approaches ignore. Since DNS works unobtrusively behind the scenes, it makes an excellent vehicle for communicating with internet-based systems and exfiltrating information. The only way to plug the DNS hole in your network security is to directly address the vulnerabilities unique to DNS. Read this white paper to gain insights into critical information to safeguard against DNS security threats and disrupt malware communications to your DNS servers.